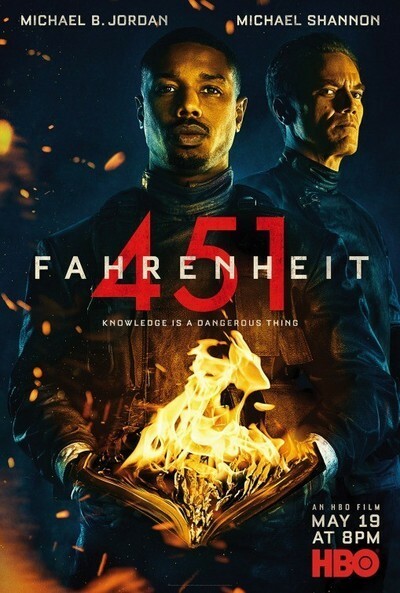 In light of current events, one can easily see why Ray Bradbury’s 1953 novel “Fahrenheit 451” felt ripe for a new adaptation. This is a story about a government that censors and bastardizes art it finds troublesome, while making ownership of the original, unexpurgated versions a treasonous crime. Any unapproved art, mostly books, are burned by a group of firemen led by Captain Beatty and his successor-in-waiting Guy Montag. While they hunt down the novel’s equivalent of “fake news,” most of the populace has been voluntarily anesthetized by mass media designed to give them exactly what they want. François Truffaut took on this material in 1966, and now director Ramin Bahrani has created a 2018 adaptation for HBO. This version changes Bradbury’s older, unhappily married protagonist into a much younger and virile Michael B. Jordan and adds language far saltier than the “damns” and “hells” that once got the novel in trouble with censors. Bahrani and his co-writer Amir Naderi also attempt to update the story for today’s audiences. As a result, several plot points are either modified slightly or changed beyond recognition. Fans of the novel may find these new additions to be blasphemous, but fealty to the source material is not a requirement in adaptations nor is it always welcome. However, this take on “Fahrenheit 451” has a bigger problem than its occasionally unsuccessful changes. For just as the evolution of television has weakened the satirical direction of Paddy Chayevsky’s “Network” by bending it toward documentary, so too has today’s political climate steered Bradbury’s science fiction ideas into the realm of the factual. Ironically, much of the novel’s shock value and allegorical power also feels weakened as a result. “Stay Vivid on the Nine,” says the reporter whose visage is projected onto skyscrapers throughout a futuristic version of Cleveland. The Nine is a state-run combination of Twitter and a 24-hour news channel, with cascading emojis and text serving as real-time commentary on whatever topic is trending. It’s the only game in town; there doesn’t appear to be anything else to watch. The Nine also broadcasts book burnings and the arrests of the “eels” who have been hiding the doomed reading material. The stars of this particular program are Montag and his superior, Captain Beatty (Michael Shannon). They’re part of a group of powerful firemen who use flamethrowers to burn not only books but the homes of criminals found in possession of contraband. Montag loves his job—and the publicity—until an old woman decides to self-immolate rather than go quietly while her library of books gets destroyed. Before she lights the match that ends her life, she mutters a word that appears to be code. The powers that be at The Nine change her final word to something more crowd-pleasing, though as someone points out, her lips don’t match the soundtrack. Montag is so shaken by the woman’s suicide that he steals a book so that he may understand why someone would die for it. Montag’s uncertainly increases when he falls into the orbit of Clarisse (Sofia Butella), a double agent who serves as both a snitch for Captain Beatty and one of the leaders of an underground book club big enough to rival Oprah’s. Meanwhile, Captain Beatty has been writing phrases and ideas on small strips of paper he subsequently burns. The older Beatty has some familiarity with books and the time before they became banned. He tells Montag that books are full of non-existent characters whose ideas have the capability to upset people, harshing their mellow and interfering with the perpetual happiness that The Nine offers. “Fahrenheit 451” points out that while the government passed the censorship laws, it was the people who clamored for them to be passed. This is a major idea that the film doesn’t really contemplate; the general public is represented solely by the aforementioned emojis that cover The Nine. If you’ve read the book or any of the writing Bradbury did regarding his novel, you’d know that the genesis of the idea that books bring unhappiness started with folks complaining about lack of representation or lackluster characterizations of minorities and women. Captain Beatty briefly alludes to this in a scene where he uses the N-word while explaining why people originally complained about a particular book. This premise is a sharp, pointed and potentially offensive one that warrants further interrogation, but this film is unwilling to cut too deeply. As for the actors: Michael Shannon is well-cast here. He’s intimidating when he’s barking orders and does a fine job with his monologues. Despite having top billing (and a producer credit), Michael B. Jordan isn’t given a fully fleshed out character to play. We never really feel his dilemma nor his trauma. And his romance with Clarisse (who also isn’t fully realized) is as unwise as the film’s ridiculous usage of a bird with literature in its DNA. This is one of those additions that just doesn’t work. On the plus side, that bird figures in scenes with a group of book-remembering rebels led by the great Khandi Alexander. I wish “Fahrenheit 451” had been as dynamic and fiery as its very effective opening credits sequence. Bahrani shoots extreme close-ups of book pages burning, their words and images contorting and exploding grotesquely across the screen. There’s a kinetic energy to it, a promise of something far more daring than we get. Despite boasting a darker fate for Montag than Bradbury envisioned, this version of “Fahrenheit 451” lacks the burning commentary that would justify why the filmmakers wanted to revisit this story in the first place. Just read the book, folks.